A biography of the famous satirist and author of Gulliver's Travels. For Stubbs, Swift was neither a monster nor an angel but, in his life as in his work, a man of radical ambivalence and profound contradiction, forever pulling (or being pulled) in opposite directions ... As Stubbs demonstrates so persuasively in this fine biography, Swift, more than most, was a divided soul. He was an ostensibly devout believer who held that religion could teach us how to hate but not how to love. He was undoubtedly misanthropic, yet he was a formidable opponent of slavery and war and could be gentle and sympathetic when dealing with people in person. He hated Ireland and the Irish, yet thought it proper to defend the country and its inhabitants from English force ... he focuses on illuminating the profound fissures of Swift’s sensibility and on examining the ways in which they inform his works and relate to the religious and political turmoil of his era. He does so with grace, verve and great care (at times this book is almost oppressively thorough), and he considers the subtleties of Swift’s character, and the intricacy and importance of his thought and writing, with insight, intelligence and an appealing commitment to seeing his subject whole. ...through agile prose and erudition [Stubbs] succeeds in offering something delicate, subtle and new ... In Stubbs’s fine and sensitive book, he emerges an embittered, deeply humane man: someone who turned his own experience of abandonment and humiliation into a vicious literary scourge of the callous and powerful establishments of his time. Stubbs restores Swift’s writing to its rich religious and cultural contexts without diminishing its autonomy. In this excellent literary biography, Stubbs draws on extensive research to contextualize Swift’s courtier’s life within the hurly-burly of 18th-century foreign and domestic politics, also inspecting Swift’s clerical life within the doctrinal struggles of the church. He studies Swift’s literary motivations and professional contradictions: a man who disavowed political parties but became a Tory operative; a fastidious, conservative priest who became 'king of the mob,' rebelling against the established order with satire that delved into the stink of daily life ... In his early chapters, Stubbs falls into a scholar’s trap: oversharing hard-won research. He digresses too often, losing Swift in a blizzard of ancillary detail. That structural haze rapidly clears, however, and is redeemed by stellar prose, a firm narrative grip and nuanced historical and literary readings. Private yet performative, generous yet stingy, conservative yet rebellious, Swift was a knotty character. Stubbs brings an incisive intellect to the task of untangling him. 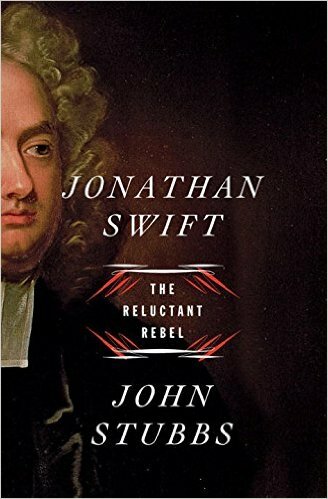 What did you think of Jonathan Swift: The Reluctant Rebel?